Let's get one thing straight, I am NOT a morning person. As much as I would like to be, I have come to the fact that early mornings will never be my thing (unless I need to make an early flight that is taking me somewhere tropical). I went two year straight waking up at 5:30 in the morning so I could get my workout over before I headed to work, and guess what, I was miserable! Besides those two years, I was fortunate enough where my work day never started before 9am, and now that I have two kids, I am blessed that my boys are pretty late sleepers. Because I'm not a morning person, lets just say that I'm not the most pleasant person to be around when I wake up. However, I have a few tricks that not only help me feel more awake, but they instantly put me in a better mood. The first is drinking lemon water. 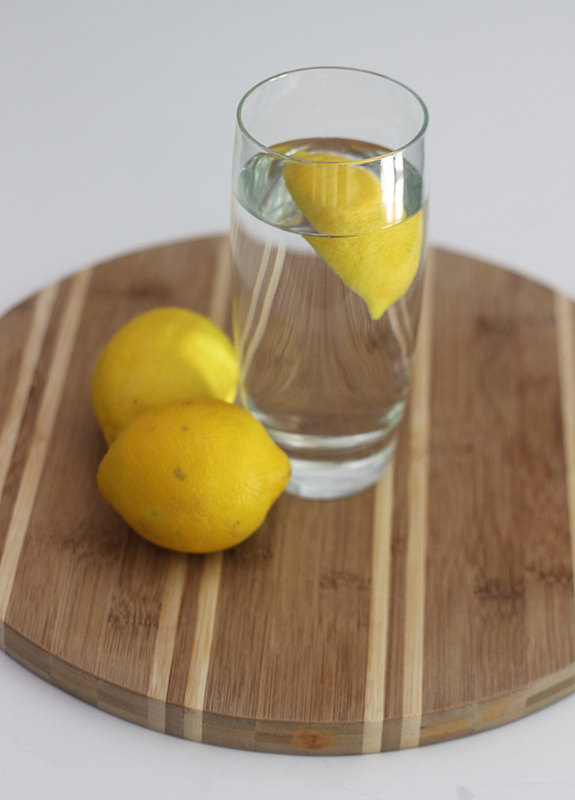 Even before I make my coffee, I down a glass of water with lemon. It's not only a great way to get your system going in the morning, but it's important for digestion, and helps flush out any toxins. I am a huge water drinker, and notice that my energy level is lower on the days that I don't get enough water. After my lemon water, I have my coffee. I have to admit that on most days I drink two cups of coffee, as it gives me life. Something that I try to do daily, is get up before my boys so I can have a little me time, and enjoy my coffee in peace and quiet. I can't tell what this does for my mood. Not only am I a much happier person in the morning, but I feel like I'm more productive throughout the day. Being comfortable in the morning also effects my mood. Because I don't work out until the boys go down for their naps at noon, I am in my pajamas for a good portion of the morning. I'm one of those people who are always cold, and with the air conditioning blasting, socks are one of the first things that I reach for. This pair from Happy Socks is my favorite. Happy Socks are known for all their fun prints and colors, and not only am I obsessed with the brand, but my husband is too! I mean, who wouldn't be happy wearing these socks? Now I'm not one to normally walk around in my skivvies, but I had to share these very happy underwear. Not only are they cute, but they are extremely comfortable. The last thing that puts me in a happy mood, any time of day, is having my nails done. There is something about a good manicure that makes me feel put together. Being a stay at home mom, I rarely have time to go to the nail salon, so I end up doing my own nails. 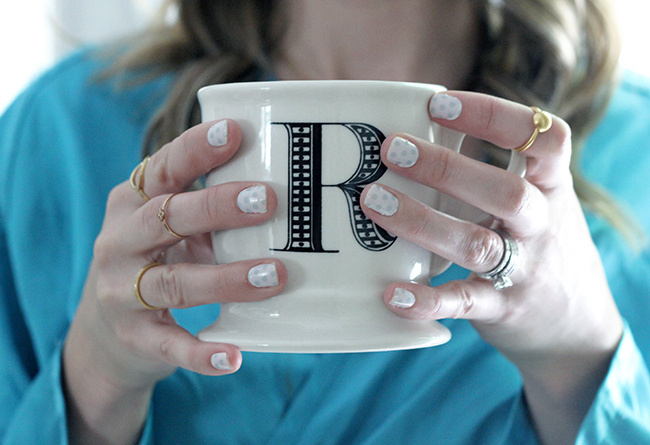 I've always loved the idea of fun nail designs, but had never been able to do them myself. That is until I discovered Jamberry. My friend Jill, who is a Jamberry Independent Consultant, sent me some samples to try, and I am truly impressed. I mean, how cute are my polka dot nails?? Jamberry are nail wraps that easily stick to your nails. Not only are they simple to apply, but there are so many patterns to choose from. I highly recommend checking them out here, and trying them yourself. I'm also excited to be giving away a sheet of rainbow nail wraps to one lucky winner (each sheet provides two manicures and two pedicures). To enter, all you have to do is leave a comment below. I will be choosing a winner at random, and announcing them on Friday's post, so make sure to stop back! (Open to US residents only). I'm not a morning person either, my kids know not to talk to me till after my coffee! Ha! I love jamberry!! I have heard drinking lemon water is beneficial. I need to start! I am always a coffee person too. I am definitely not a morning person either, like what so ever haha! Love these tips! I keep water by my bed to drink right when I get up! I love those socks!! This is great advice, I normally listen to happy music in the morning to make me joyful! I drink a tall glass of water too first thing in the morning !!! I love my coffee BUT I always have heard drink a cup of water first. I love my nails painted ! I always feel put together when my nails are pretty :) Happy Monday ! I love how confidently you rock this underwear and these socks, looking good. I really want lemon water and coffee now. Mornings are the worst! Great tips! I always drink also water in the morning, but not with lemon. That is a great idea! Love this! I'm slowing becoming a morning person... I always start my day with lemon water!! I am trash in the morning, but I love these tips. I am definitely going to try and start my day with lemon water!! Cutest socks and undies!! Great tips, loving the photos too! Good for you for starting with a glass of water before hitting the coffee! I too try to do the same thing because I know how much my body needs the hydration (especially important before I go and put a diuretic like coffee into my system). I agree with the need to enjoy coffee in peace. Right now I stay in bed until my baby girl wakes up and forces me out of bed (I too am not a morning person but wish I was) but I really would prefer to have a few minutes to myself to wake up my brain before the day begins. I am definitely not a morning person either. I need to try drinking lemon water in the morning, it sounds like a great idea. I love drinking lemon water in the morning :) I'm not much of a morning person, but I've definitely been working on that this summer and lemon water definitely helps! I am a huge fan of water with lemon - my most favorite drink ever. I do like and drink my fair share of coffee too. This post and your tips are great. Love the socks and undies. Great giveaway, too. And girlfriend, until I became a mom I was never a morning person, either. I have lemon and mint in my water all day long, it just so yummy. Thank you for being a part of TBT Fashion link up and hope to see you soon!